Fred Bernard Ballard, 84, of Summerville, husband of Greta Laurel Ballard, passed away on Thursday, March 15, 2018. Visitation will be held Sunday March 18, 2018 from 4pm until service time at Summerville Baptist Church, 417 Central Avenue, Summerville, SC 29483. The funeral service will follow at 5pm. Burial will be in Summerville Cemetery. In lieu of flowers donations may be made to the Master Chief Fred Ballard Summerville High School NJROTC Scholarship Fund, 1101 Boone Hill Road, Summerville, SC 29483. Mr. Ballard was born on Sunday August 27, 1933, a son of the late Walter Ranze Ballard and Nellie Mae Foster Ballard. 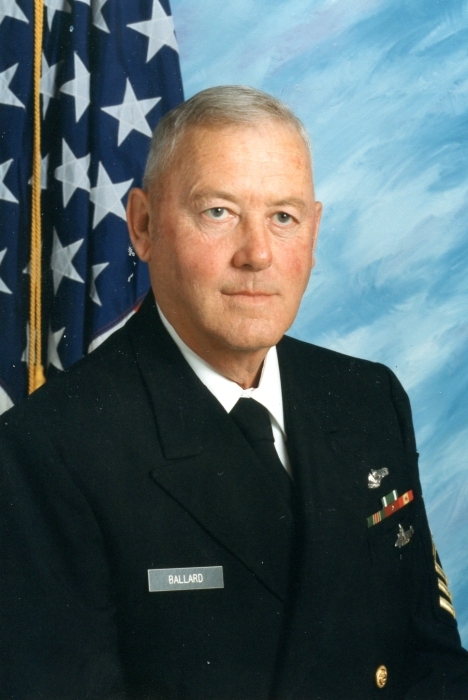 Mr. Ballard was retired Master Chief with the United States Navy, and retired from Summerville High School as the NJROTC instructor. Mr. Ballard is survived by his wife Greta Laurel Ballard; son, Fred Ballard, Jr. (Mary) of Mustang, OK; daughters Stephanie Ballard Trzeciakiewicz and Amy Ballard Bowman (Kenny) of Summerville; brother Jerry L. Ballard of Spartanburg, SC; sister Patricia Ballard Dobbins (Fred) of Chesnee, SC; six grandchildren Fred Henry Ballard, Foster Ballard, Grady Bowman, Gareth Ballard, Laurel Trzeciakiewicz and Ashton Bowman; two Great Grandchildren; numerous nieces, nephews, and sister in laws.Mr. Ballard is predeceased by parents, Walter Ranze Ballard and Nellie Mae Foster Ballard; sister Erleen Ballard Cannon; brothers Max Ballard, Jack Ballard, Bobby Ballard, and Ray Ballard.